I started the project: sewing room a couple of years to document the changes/additions I make to my sewing room. 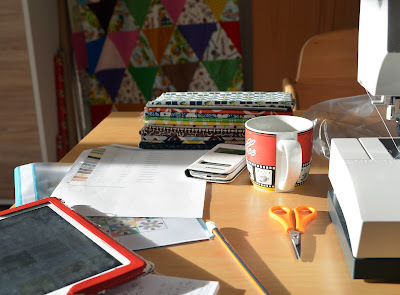 Along the years, I have wanted to make updates and improvements to my sewing room, but I am a true minimalist at heart. Okay, if you want to know the truth, I don't know the first thing about interior design. Along with being conditioned not to collect things since I moved around a lot, I tried to keep the minimum around without having to throw it away the next time I moved. 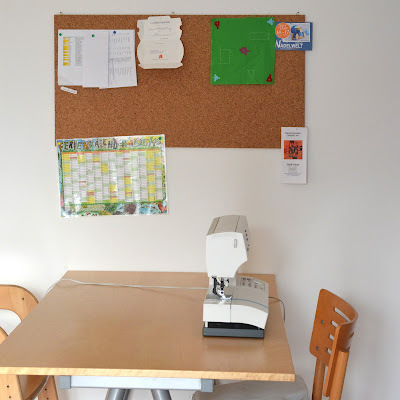 I have two new milestone improvements to my sewing room! Yeah! The most important addition is my thread rack. For years now, I have been asking my sewing friends what they use for storing their threads. 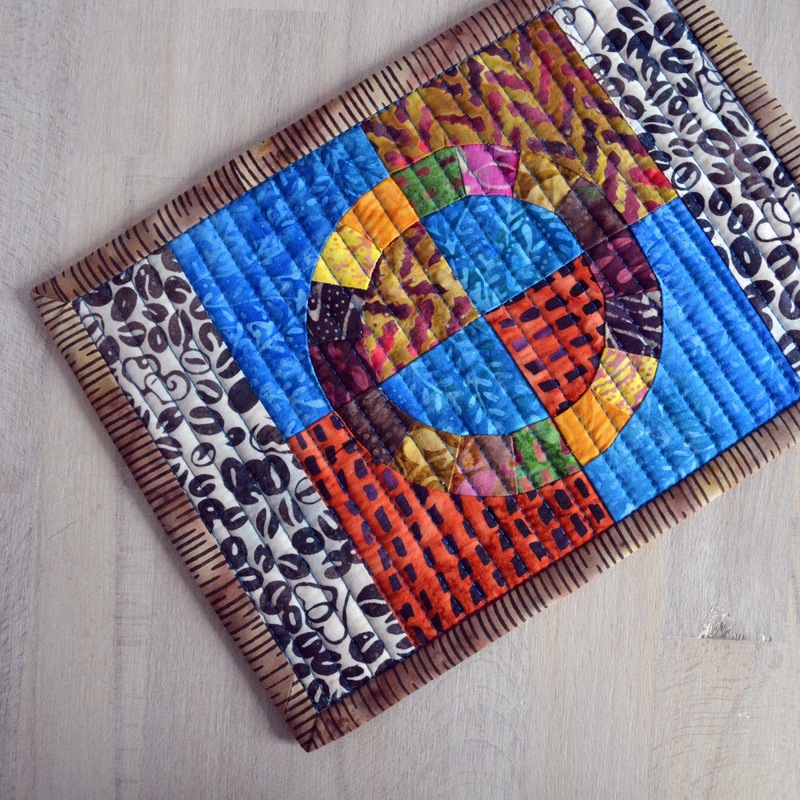 Katrin of Cattinka uses this really cool idea of storing her threads on baking sheets. Her husband made a really cool storage rack for it too. I was definitely jealous when I saw hers. I even went out and bought a bunch of supplies to make my own thread rack, and my husband kindly asked me to return the items so he could "think of something" and make it himself. You see, I had specifics...I wanted a thread rack that enclosed my thread, and you could see it all at a glance. As months stretched on to a year, he came up with a plan, not to make the shelf, but rather "have it made." I was okay with that. Of course, it always (sentimentally) means a little bit more when your sweetheart makes something for you, but if we could find it a little cheaper and didn't have to worry about building it, that would be okay too. He did his research (my husband LOVES TO DO RESEARCH) and found an awesome place to have the rack made - vitrine24. The rack or "display case" is custom-made with the measurements 19 1/2 inches x 29 inches or 50cm x 75cm. It is separated into two parts. The top part and bottom part are equal in size, but you can have it adjusted and made however you wish. Both parts have two, clear Plexiglas doors that slide open from the sides. There are NO SPOOL INSERTS. I just wanted a place to "display" my thread and keep it free of dust. The second addition to my sewing room is a pin board. 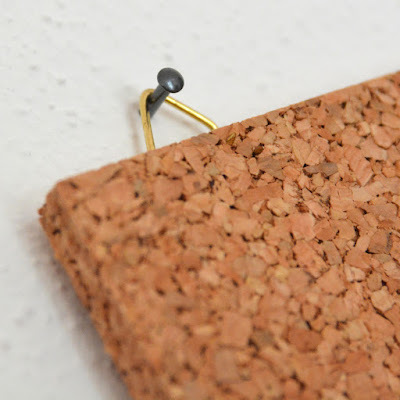 I bought a cork panel ~ 50 x 90 cm from the local home building and supply store (BayWa) and inserted three, metal picture hangers into each side and in the middle on the back to hang it up. If you are wondering why I didn't install the thread shelf above my sewing table, there are two reasons, actually three. The pin board was already installed before the thread rack. That means, there were already holes in the wall. We can't go making more holes now can we? I like to see my colorful threads. At the table, I wouldn't be able to see anything if I am sitting there. I might change my room layout around in the near future. My sewing table would go where the cutting table now is. Then the threads would be at my back. Thanks for stopping by. Next time, give me a call and I'll brew a special coffee just for us! Last year I participated in a lot of smaller swaps and made loads of pillow covers but only finished one large quilt - my easypatchwork Advanced Sampler (which I have not shown simply due to its large size). This is hard for me to believe, because I started out making only bed and lap size quilts. I love to "use" my quilts. I generally do not display my quilts nor my finished patchwork pieces; you might not even get that I am a quilter if you entered my home. My large quilts, on the other hand, are completely in use. We have our favorites around here which stay neatly folded in the living room. 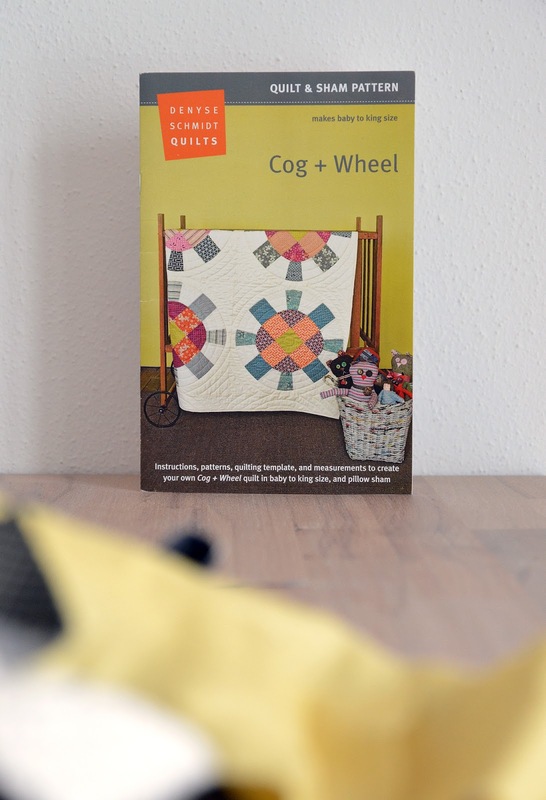 Leaves a'Flutter, American Primer and the Man's Quilt are our favorites! I decided I want to make another large quilt this year and have been looking around to see what really interests me. 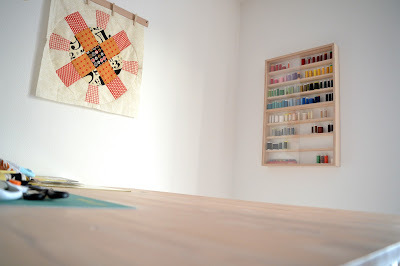 After more than 10 years of quilting, I want to sew what really interests me. Last year, it was on a journey of 60° triangles. And this year, circles seem to be catching my attention. NOTE: I love men's quilts! I have always loved men's rugged, outdoor clothing-style. I still love it and realize I need this warm feeling in my living room. In total contrast to my sewing room which is white on white on white wood, my living room is dark on dark wood with a dark red sofa and dark quilts. I am not typically drawn to white/bright and colorful quilts for actual use. They just don't "comfort me." What is your opinion about this? Around October last year, I started picking out circular designs that interested me and started writing them down to explore them in further detail. 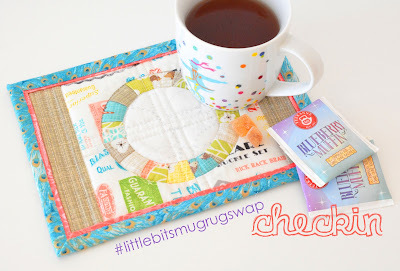 I first made the Little Bits Mug Rug by Alexia Marcelle Abegg. Honestly, that was one of the hardest circle designs I have sewn other than an adapted Western Compasses due to the tiny bock size of three inches. Segments less than one inch are hard to sew with a curved seam. One pattern that really caught my eye is this one from Denyse Schmidt. It doesn't look like a typical, traditional Drunkard's Path block. I like the white background and white segments included to make the "path" look more like a cogwheel. I was totally mesmerised by this block/quilt. I ordered the pattern. Then I realized, Denyse Schmidt designs fabric too; fabric that I love!! (I actually have bought her fabric in the past, but didn't think too much about fabric designers or their styles nor my style.) I tried to order fabric around Christmas to maximize my € through sales in the United States. I was not successful as I wanted to be. My challenge was this: I didn't want to use just one collection; I wanted to use them all!! My basic color scheme was black, brown and some bright colors. 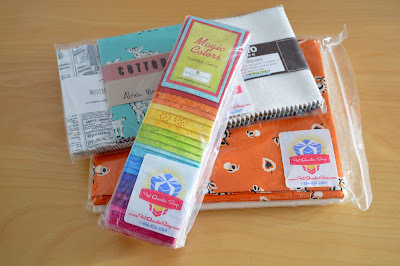 I mapped out the quilt in my head and started ordering a few fabrics primarily from her Katie Jump Rope collection. Now it was going to get serious! It is not cheap to import great quilting fabrics. For every order I make, I have to include 25€ for shipping and add 20% (of the total order + shipping) for German Sales Tax (Mehrwertsteuer). Import tax is not included on orders less than 150€ (if I remember correctly.) When I make an order, I try to spend about 100€/$ to maximize my spending. I had to see exactly how much of each fabric I needed! How? I looked for one shop that had all of my fabrics but that was not possible. No one had them all. In the end, I ordered from four different shops; Fabricworm for the original pattern, the Fat Quarter Shop, Pink Castle Fabrics and Fabric.com and am still waiting on a couple of fabrics. Once again, I had to maximize my spending and ordered a few more things too. Because if I am going to spend some money, I should buy more more beautiful fabric as well, don't you think? And this is the last shipment. It literally arrived just 10 minutes ago. You know what that means don't you? Time to get started. Last Shipment of Fabrics - now I must stop writing and start working!! First up, washing fabric. I don't normally pre-wash except for backing fabric, but if the fabric/pattern designer writes that, then I must do it. Today is the big day that all of the participants of the Little Bits Mug Rug Swap checkin! Are you excited? I am!! Have you received your partner information? Emails were sent out in December. Have you made contact with your partner? Have you started making your templates and choosing fabrics? Or are you already finished and shipped your mug rug and goodies to your partner? I have already received a few emails from your creations. They look pretty HOT too! I hope to see plenty more beautiful creations using Ms. Alexia Marcelle Abegg's - Green Bee Pattern - the Little Bits Mug Rug. Do not iron but fingerpress until you have the entire circle together sewn together or just don't use steam when ironing. Make sure your seam allowances flips backwards when sewing so they don't hang under the presser foot and make a pleat. Use lots of pins; I used almost 20 for sewing the inner three inch quarter circle. Take your time. Drink a cup of coffee or tea. Don't be afraid to use your seam ripper! The Little Bits Mug Rug below is going out to MY partner. I think she will like it. She already gave me a her approval which makes me very happy. 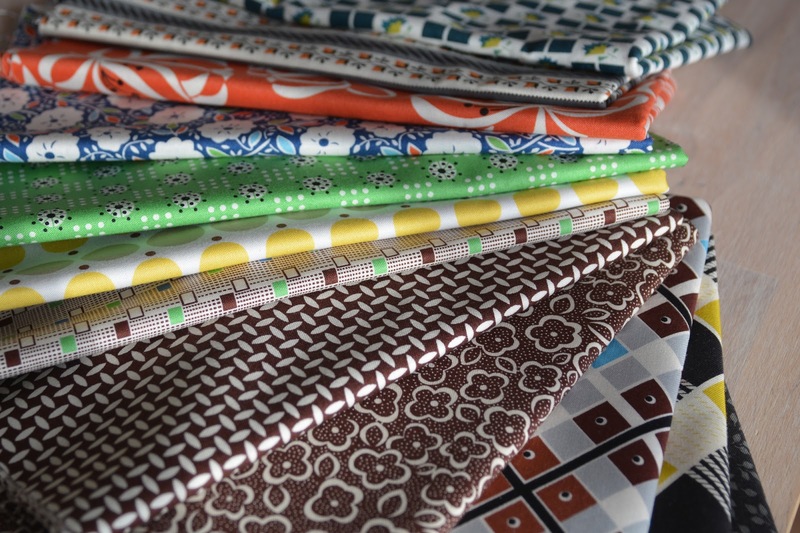 I have been wanting to make a quilt with these fabrics for almost two years now. I thought it was time to get them out and put them to use. I love the gray and yellow combo. Don't you? So, for all of the participants, please check in. Just send me an email or tag me on Instagram with a photo of your progress. All of us are so very curious to see what you've done with this challenging but awesome pattern! Thanks, Alexia for creating such a beauty! Thanks for participating and reading up about all our fun! 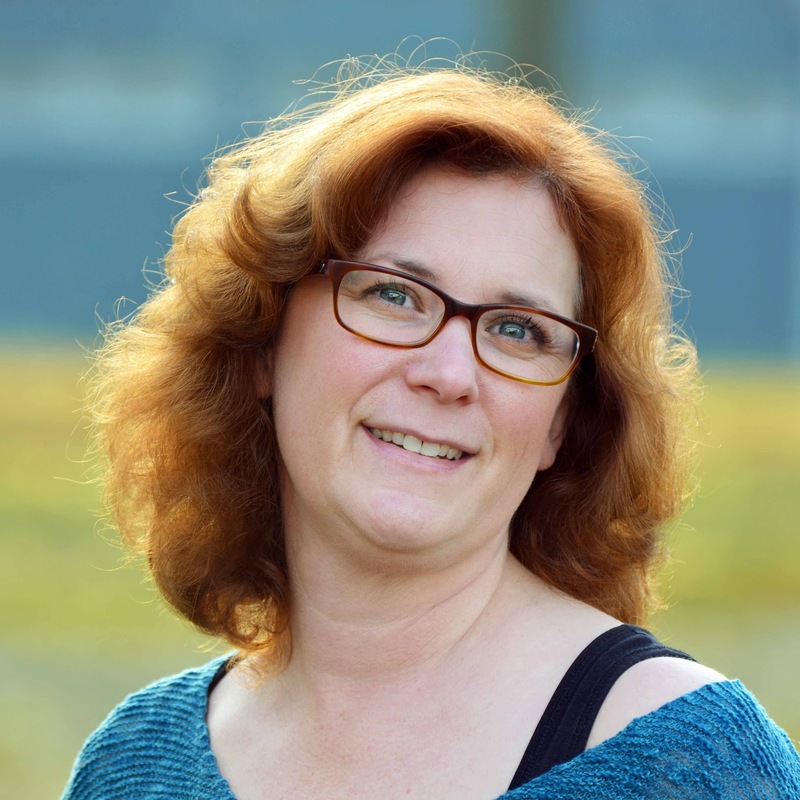 Susanne Schreiber was the winner of the GIVEAWAY! Congratulations!!! First up, you can find my blog posts now listed on the quilterblogs.com. Thank you so much for listing me, Aleah. I hope to bring some enthusiasm and good sewing practices to the quilting community. You can find some really great deals and coupons on their site, too. And they have a really awesome search engine to find the fabric you are looking for quicker and easier. I don't know how many times I wished I had known this sooner!? And you? If you are reading this post from the quitlerblogs, thank you AND welcome. May I introduce myself...my name is Karen Ackva. I am an American living my dreams in Germany with my bi-national family. I love to design and make patchwork (as it is called here in Germany.) You can find plenty of free patterns and tutorials on my site as well as on Craftsy. 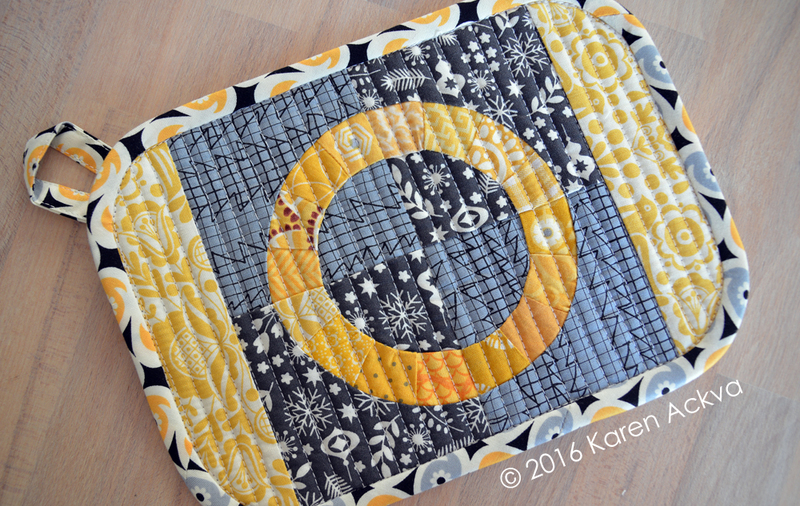 I have designed blocks for the Quiltermaker's 100 Blocks Vol. 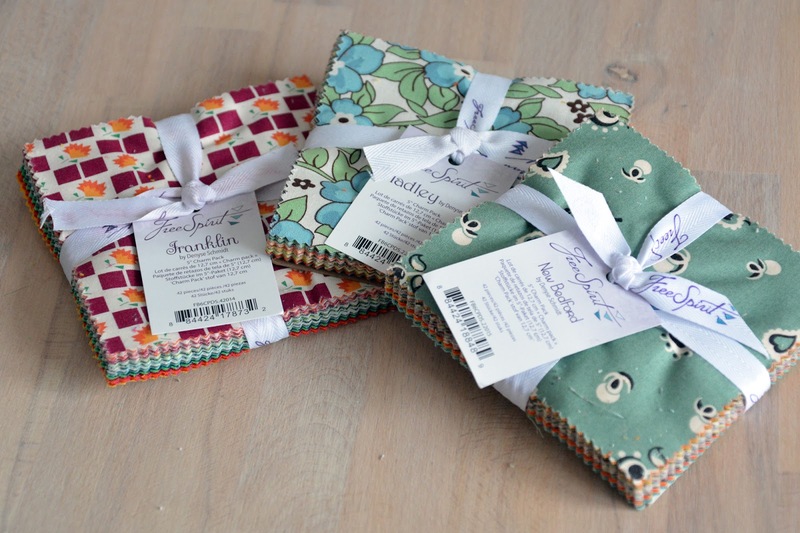 11 & 12 and a quilt coming out in Spring 2016. 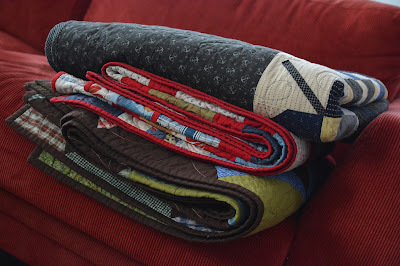 I have also designed a few quilts for the Moda Bake Shop using their pre-cut layer cakes, charm packs and jelly rolls. I am commited to bringing out well written patterns at a reasonable price. So, check all of them out. : ) When I am not designing, I like to organize and participate in patchwork swaps on Flickr (Pillow Swap Four Seasons) and various swaps on Instagram. I don't want to overload you with all of the goodness I have to offer you on my first post, so I will pace myself with my other tidbits and future makes for 2016! Stay tuned! : ) Thanks for dropping by! Have a great year!